The last general election was a dream. On 9 May 2018 which also happened to be my birthday, for the first time in Malaysia's history, unexpectedly, the opposition won the election. It became the headline for many countries. It showed that the Rakyat chose their leaders. A great evidence of democracy. 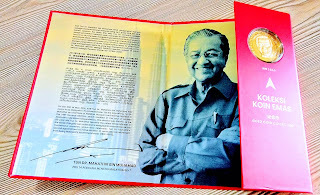 The other historical moment was when Tun Dr Mahathir was sworn in to be the prime minister for the second time. At the age of 93, he remained charismatic and dedicated. Not only is he the oldest serving state leader in the world, he has also previously served the nation from 1981-2003 ( even before I was born!). Well, I'm not here talking about politics. Being a budding geriatrician, I'm well aware of the physical limitations ageing can cause. And much to my respect, Tun Dr Mahathir defies it all. Even his wife, Tun Dr Siti Hasmah is aging gracefully and still has sharp mental faculties. The people are just in awe. Age is not a limit to attain great achievements. There's no such thing as one is too old for anything. We decided to get our hands on Tun Mahathir Commemoration Coin as a memento. To remind ourselves that nothing is impossible. The Star dedicated an article for Tun Dr Mahathir's achievements 3 days after the election ended. 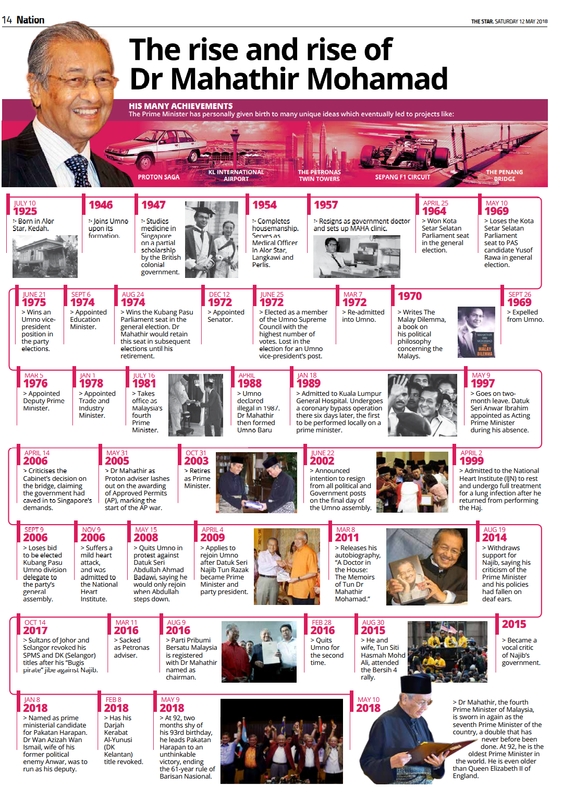 I love how beautiful this diagram depicts his contributions to Malaysia. Despite having to go through a coronary bypass grafting in 1989, he remains tenacious. What an attribute! 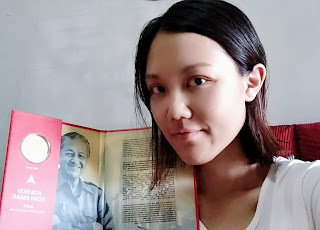 Even soyacincau.com has a list of tech legacies spearheaded by Tun Dr Mahathir. 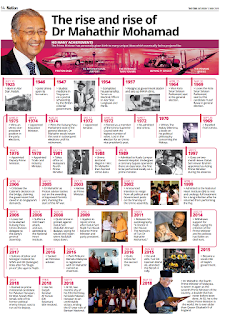 His vision for the development of Malaysia, to put us on par with the rest of the developed world. This commemoration coin is made of 0.1g gold and a beautifully carved Tun Mahathir's portrait. The casing documented a brief history about Tun Mahathir with his signature at the bottom of the page. The cover also features the now Pakatan Harapan logo which means The Alliance of Hope. We wish the 'new' Malaysia the best led by the 'new' government! 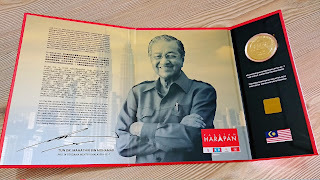 Interested to get a copy of Tun Mahathir Commemoration Coin? Get it here. yes, I agree with you...He was so charismatic despite his age now right? how I wish I got this too~ will try to get one soon! Lea dh ada syiling ni.. Buat koleksi peribadi.. 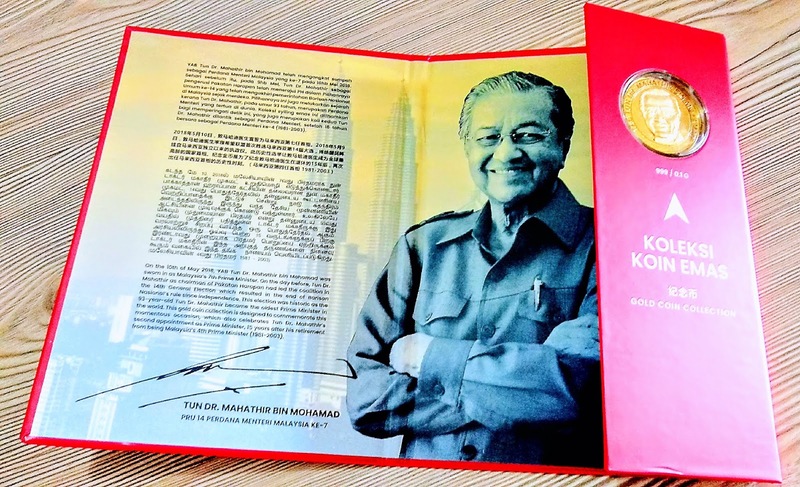 Coin khas dr tun M ni bernilai tak? Sebagi mengingati jasa beliau spjg pentadbirannya kan.. This is so cool. 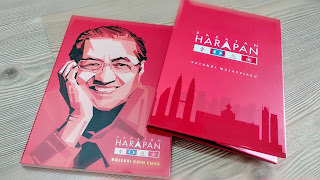 Memang betul2 emas la kan? How much is the price ye? This is one of the momentus item. I also wish to have a set, will check it out.